1. Physiological solution: 0.7% NaCl in distilled water. Autoclave and store at 4°C. 2. Hypotonic solution: 0.5% Tri-sodium citrate dihydrate in distilled water. Autoclave and store at 4°C. 3. Fixative solution 1: 2% Formaldehyde, 45% acetic acid in distilled water. All fixative solutions have to be freshly prepared. Formaldehyde is highly toxic and carcinogenic. It is harmful to breathe the vapors and it may irritate the skin. Acetic acid is also harmful. Wear gloves and use these substances in a chemical fume hood. 4. Fixative solution 2: Methanol/acetic acid/distilled water (5 : 2 : 1, v/v/v). Methanol is poisonous. It may be harmful by inhalation, ingestion, and skin absorption. Use it in a chemical fume hood. 5. Fixative solution 3: methanol/acetic acid/distilled water (5 : 2 : 3, v/v/v). 6. Chromosome isolation buffer: 120 mg MgCl26H2O, 1 g citric acid, 1 mL Triton X-100, and distilled water to 100 mL. Sterilize by filtration and store in aliquots at -20°C. 8. Microscope slides, siliconized and nonsiliconized. 9. Siliconized cover slips, 18 x 18 mm2. 10. Cover slips (nonsiliconized), 24 x 24 mm2. 14. Liquid nitrogen. Caution: Wear cryo-mitts and a face mask. 15. 1 mg/mL DNAse I stock solution (from bovine pancreas, grade II; Roche). 16. 10X Nick-translation (NT) buffer (for DNase I treatment): 0.5 M Tris-HCl, pH 7.8-8.0, 50 mM MgCl2, 0.5 mg/mL bovine serum albumin (BSA). Store at-20°C. 17. 10X Phosphate-buffered saline (PBS): 80 g NaCl, 2 g KCl, 2.4 g KH2PO4, 14.4 g Na2PO4, and distilled water to 1 L. Autoclave and store at 4°C. 2. PTX solution: 1X PBS, 1% Triton X-100, freshly prepared. 4. PBS/BSA solution: 1X PBS, 1% BSA. Sterilize by filtration and store in aliquots at -20°C. 5. Primary antibodies. They lose activity every time they are thawed; therefore, it is advisable to store antibodies frozen in aliquots, and once thawed, to store them at 4°C. 6. Fluorochrome-linked secondary antibodies. They are light sensitive. 1. DAPI (4',6-Diamidine-2-phenylindole dihydrochloride) stock solution: 1 mg/mL DAPI in distilled water. It can be stored in the dark at 4°C. It is a carcinogen and an irritant. It may be harmful by inhalation, ingestion, and skin absorption. Wear gloves and use it in a chemical fume hood. 2. 20X SSC: 3 M NaCl, 0.3 M sodium citrate, pH 7.0. Sterilize by autoclaving and store at room temperature. 3. DAPI staining solution: 3 ||L of DAPI stock solution in 60 mL of 2X SSC. It can be used for up to a week if stored in the dark at 4°C. 4. Antifade: 233 mg DABCO (1,4-diazabicyclo-[2,2,2]-octane), 200 |L of 1 M Tris-HCl, pH 7.5-8.0, 9 mL sterile glycerol, 800 |L sterile H2O. DABCO may be harmful by inhalation, ingestion and skin absorption. Wear gloves and handle it in a fume hood. 1. Transfer third instar larvae into drops of approx 50 |L of physiological solution placed on a siliconized slide and dissect out the brains (see Note 2). 2. Transfer the brains to a drop of hypotonic solution for 8 min at room temperature (see Note 3). 3. Transfer the brains to fixative solution 1 for 8 min. 4. Transfer four fixed brains into corresponding four small drops of the same fixative solution and place on a clean 18 x 18-mm2 siliconized cover slip. 5. Lower a clean nonsiliconized slide on the cover slip, invert the sandwich, and squash gently for about 1 min between two sheets of blotting paper. 6. Freeze the slide in liquid nitrogen and flip off the cover slip with a razor blade. 7. Immerse the slide in 1X PBS at room temperature (see Note 4). 1. 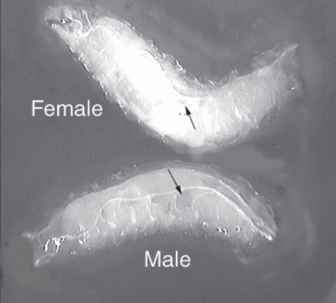 Transfer two or three third instar larvae into a drop of approx 50 ||L of physiological solution placed on a siliconized slide and dissect the brains (see Note 2). 2. Transfer the brains into hypotonic solution for 2-10 min (see Note 3). 3. Transfer the brains to a drop (approx 9 |L) of fixative solution 2 or 3, placed on a 18 x 18-mm2 siliconized cover slip (see Note 5). 4. Mash the brains using a couple of syringe needles to make a homogeneous suspension during fixation (see Note 6). 5. Lower a clean nonsiliconized slide on the cover slip, invert the sandwich, and squash very gently between four or five sheets of blotting paper. 7. Immediately immerse the slide in 1X PBS at room temperature (see Note 4). 1. Transfer third instar larvae into drops of approx 50 | L of physiological solution placed on a siliconized slide and dissect out the brains (see Note 2). 2. Transfer the brains (8-10 brains) to hypotonic solution for 10 min. 3. Transfer the brains to a 9-| L drop of chromosome isolation buffer placed on a clean 18 x 18-mm2 siliconized cover slip. 4. Mash the brains using a couple of syringe needles to make a homogeneous suspension and leave for 4 min (see Note 6). 5. Lower a clean nonsiliconized slide onto the cover slip, invert the sandwich, and squash very gently between four or five sheets of blotting paper. 7. Immediately immerse the slide in cold methanol (-20°C) for 5 min. 8. Remove excess methanol by leaning the slide on a sheet of blotting paper and immediately immerse it in cold acetone (-20°C) for 1 min. 9. Immerse the slide in 1X PBS at room temperature (see Note 4). 4. Transfer four fixed brains to corresponding four small drops of the same fixative solution placed on a clean 18 x 18-mm2 siliconized cover slip. 5. Lower a clean nonsiliconized slide onto the cover slip, invert the sandwich, and squash gently for about 1 min between two sheets of blotting paper. 8. Stain the slide in DAPI staining solution for 4 min and wash in 1X PBS for 5 min. 9. Mount the slide in a drop of 1X PBS and seal the cover slip with rubber cement. 10. Look at the preparation under a photomicroscope, take pictures of good mitotic chromosomes, and save as many images as possible (see Note 9). 11. Remove the rubber cement and put the slide in a Coplin jar containing 1X PBS and let the cover slip fall from the slide into the jar. 12. Onto the slide, put 100 ||L of 1 % DNase I stock solution in 1X NT buffer for 8 min at room temperature (see Note 10). 13. Wash the slide in 1X PBS three times for 5 min each. 1. Put the slides with fixed chromosomes in PBS in a Coplin jar containing PTX solution for 10 min. 2. Incubate the slides in 1X PBS with dried nonfat milk for 30 min (about 1 spoon of milk in 40 mL of 1X PBS). 3. Clean the slides in 1X PBS for 3 min. 4. Dilute the primary antibodies in PBS/BSA at a concentration appropriate for the antibody. 5. Put 10-15 |L of the antibody solution on the mitotic preparation and incubate for 1 h at room temperature and overnight at 4°C in a humid chamber. 6. Wash the slide three times in PBS for 5 min each wash.
7. Dilute the fluorochrome-conjugated secondary antibodies in PBS/BSA at the recommended concentration. 8. Put 10-15 |L of the secondary antibody solution on the mitotic preparation and incubate for 1 h at room temperature in a humid chamber. 9. Wash the slides three times in 1X PBS for 5 min in the dark. 1. Stain the slides in DAPI staining solution at room temperature for 4 min (see Note 11). 2. Wash the slides in 1X PBS for 30 s.
3. Drain the slides of liquid and mount in a drop of antifade solution using a 24 x 24-mm2 nonsiliconized cover slip (see Note 12). 4. Put the slide between two sheets of blotting paper and press gently to remove excess antifade solution. 5. Seal the preparation with nail polish (see Notes 13-15). 1. This protocol has been successfully used for immunostaining with antibodies directed against MODULO and ISWI proteins (9,10). 2. To easily dissect the brains, use two thin forceps (e.g., Dumont no. 5 Biologie). The larval mouth parts and the posterior part of the larval body should be grasped and then pulled apart. Because the brain usually remains attached to the head together with several imaginal disks and the salivary glands, the more rigid mouth parts should be completely removed with the forceps. 3. The duration of hypotonic treatment is critical. Some proteins can be removed by the hypotonic shock and cannot be visualized after immunostaining. Therefore, it can be useful to omit this step or to change the length of this treatment in some cases. 4. The slides can be stored in PBS at 4°C for 1 d before immunostaining. 5. This protocol uses two fixative solutions that differ only in the distilled water content and the time of hypotonic treatment. For example, hypotonic treatment for 2 min followed by fixation with solution 2 has been successfully used for immunostaining with antibodies directed against Heterochromatin Protein 1 (HP1) (11). Hypotonic treatment for 10 min followed by fixation with solution 3 has been successfully used for immunostaining with antibodies directed against the GAGA protein (12). Fixation in acetic acid is another treatment that can remove proteins from mitotic chromosomes. Varying the proportion of acetic acid with respect to the other components of the fixative may be necessary in some cases. 6. Brains fixed in solutions containing a low concentration of acetic acid become hard and need to be broken up before squashing. However, this procedure is very sensitive to ambient temperature and humidity. Therefore, to avoid excessive drying of the tissues during their disruption, it is sometimes necessary to increase the quantity of squashing solution placed on the siliconized cover slip. 7. This protocol has been successfully used for immunostaining with antibodies directed against histone proteins (Fanti et al., unpublished work). 8. This protocol has been successfully used for immunostaining with antibodies directed against TRITHORAX and POLYCOMB proteins (Fanti et al., unpublished work). 9. Because one of the steps of this protocol involves treating the chromosome preparations with DNase I, which will affect the fluorescence intensity of the DNA-binding DAPI fluorochrome, it is important to take pictures before the treatment to record good images of chromosomes that will later be merged with images of the immunosignals. 10. Sometimes the protein epitope recognized by the antibody can be masked because of protein-DNA folding. In this case, a light treatment with DNase I after protein fixation may enhance the protein-antibody interaction. This treatment does not produce artifactual alterations to the immunopatterns. 11. Alternatively, you can use Hoechst 33258 (0.5 pg/mL) dissolved in Hoechst buffer (HB). In this case, wash the slides in HB for 5 min, stain them in Hoechst solution for 10 min, and wash again in HB. HB is 150 mM NaCl, 30 mM KCl, 10 mM Na2HPO4, pH 7.0. 12. Vectashield (H-1000; Vector Laboratories) can also be used. 13. The slides should be stored in the dark at 4°C for 1-2 d before microscopic observation. This treatment reduces fluorescence fading. 14. Chromosome preparations are analyzed using a computer-controlled epifluores-cence microscope equipped with a cooled CCD camera. The fluorescent signals, recorded separately as gray-scale digital images, are pseudocolored and merged using the Adobe Photoshop program. 15. The immunostained slides can be used for FISH. To perform the sequential immunostaining and FISH technique, store the immunostained slides for a week at 4°C and then remove the nail polish with acetone. (However, for this purpose, it would be better to seal the immunostained slides with rubber cement that can be easily removed.) Then, the slides must be washed many times in 1X PBS. Finally, standard FISH techniques can be performed.